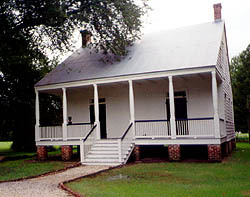 Standing in its new location on the grounds of the West Baton Rouge Museum, Aillet House is an important example of a small, Creole plantation house. The Aillet House contains five features which are themselves unusual within the Creole context. These include the single leaf attic gable doors, interior French doors, an unusual side door, interior staircase, and an enclosed hallway filling the loggia (the roofed open gallery along the front side of the building). The rebuilt masonry features original brick whenever possible. The interior retains all of its 1830s features. The house is near the museum house and a cabin, all in a park-like setting reminiscent of the house's former rural environment. The early settlers of Louisiana combined features from two architectural traditions in order to create the Creole house. One came from the French West Indies, where Frenchmen, already known as Creoles, were knowledgeable about the design and construction of houses suitable for a tropical environment. This tradition provided for multiple double-leaf doors for ventilation. The second architectural tradition contributing to the Creole house derived from the professional engineers and carpenters whom French explorer and colonizer Iberville brought to America. These men constructed buildings in simplified provincial Louis XIV and later in Louis XV styles. All permanent buildings were timber frame construction. During the late 18th century, however, Creole architecture came under the influence of two immigrant groups, the Acadians from Nova Scotia and the Americans from the eastern seaboard. The events which would bring the Acadians to Louisiana began in 1755, when the Colonel Charles Lawrence, the British governor of Nova Scotia, suddenly expelled almost 6,000 of the approximately 16,000 French Acadians who were residing in Acadie. Bernado de Galvez, the Spanish governor of Louisiana during America's Revolutionary War, welcomed Americans to the colony after they won their independence. The Aillet House, built during the transitional period of Creole architecture (1790-1860), reflects some of the Federalist style that influenced Creole housing from 1790 to 1830, but is still firmly viewed within the context of the continuing Creole tradition. Aillet House is located at 845 N. Jefferson Ave. in Port Allen. The house is open for tours 10:00am to 4:00pm, Tuesday-Saturday, Sunday 2:00pm to 5:00pm; donations accepted. Call 225-336-2422 for further information.